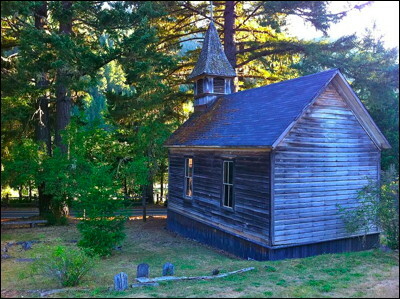 Church and cemetery with wooden grave markers at the ghost town of Golden in southern Oregon. In the late 1800s, there were several buildings, including two churches, a store, a school ... and no saloons! Must have been tough on the town's population of whiskey-loving gold miners. They had to walk 3 miles each way to Wolf Creek to imbibe!